According to our study, 84% of Irish thirtysomethings expect to own their own home. Not “want to” or “aspire to” – but “expect to”. Yet in this same group, 12% are in arrears, 33% are worried about negative equity and 68% are worried about rising mortgage debt. The reason that we Irish love home ownership is that you cannot reasonably expect to bring up a family in rented accommodation in Ireland today. The truth is that we lrish are not so much in love with ownership, but more that we hate – or even fear – the notion of renting for family life. Today, with twice as many families renting as a decade ago, it is a good time to ask Irish families why they hate renting. There is no peace of mind in renting in Ireland. Renting means not being able to budget. In Ireland your rent could double in two years, as has happened often over the decades. Finally, buying a home in Ireland is usually not that much dearer than renting. And as we’ve learned in the last few years, mortgage holders get a good deal more legal protection if they fall on hard times versus the bank – as compared to your chances as an Irish tenant versus a landlord. The alternative to home ownership in Ireland? The life of the Irish rover. These flyers get posted on here every so often for discussion. I don’t understand the issue. It’s a marketing tool, just like any pizza flyer. EA’s need a supply to sell. They could at least make them look like they haven’t been designed by a 5 year old. 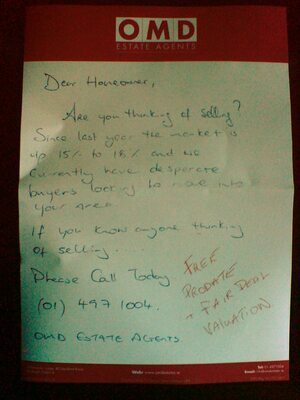 They are intentionally designed like that to make the house owner think their house was singled out by the EA, with a hurriedly hand written note because the EA is so busy busy busy… “You better contact me quick, otherwise you’ll be left behind”. Well I suppose they are a sign of things to come - Unprofessional Flyer = Unprofessional Service. It’s actually a surprisingly effective method of marketing. Years ago I had a little business that drummed up all it’s work with very stylish brochures with a hand written note on the back of it telling people that we were working in the area. For every 10 flyers put through letter boxes we got a job, but of course we were very selective about which houses we chose. A guy who did some heavy-lift garden clearing for me years back had something similar for his domestic scale landscape/gardening/paving service - he and his wife personalised the cover note to his little flyer by looking up the electoral register and Thoms Directory in the library. He was quite selective of target houses and only canvassed a small area so they were all genuinely handwritten from scratch on nice paper by his missus and he said they made sure the dents from the pen were evident! I think he reckoned (it’s a while ago now - but I was curious at the time and did ask) on about 1 in 6 getting a response and about one in three of those following through to a job of some sort. It would be a bit weird to have a flyer personally addressed to you like that! It was … especially as he sort of stalked potential customers houses by varying his commute routes (pre Street View days) and would mention possible tasks in the note. We have noticed your overhanging trees and faulty front gate … " sort of opening. I though it odd at the time and still do - never had need of him again and dunno what happened him since. He came to me through a friends recommendation - no letters required! His wife was a lovely writer though! (2) We need to build loads and loads more houses. Hearing more and more anecdotes in my own circle, of people who are completely spooked by the rises and are backing off now (“for a year or two” etc.). These are people who would have been actively looking and ready to buy, and while a rise of even up to 10% wouldn’t have mattered too much, the situation with asking prices going 30% up in the space of about 8 months has thrown them off completely. Price rises, eh? Let’s see the evidence. This is obviously the Denial phase. Still one hell of a way to go. I’m not sure what you’re driving at? Anyone looking for a house in the last 12 months has seen asking price shoot through the roof. May not necessarily be reflected in CSO or PPR stats, but ‘on the ground’ the adverts, interactions with EA’s, and some behaviour witnessed at open viewings is startling folks I know.